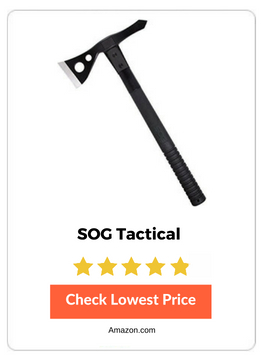 10 Best Tactical Tomahawks 2019 - Detailed Reviews & Guide! 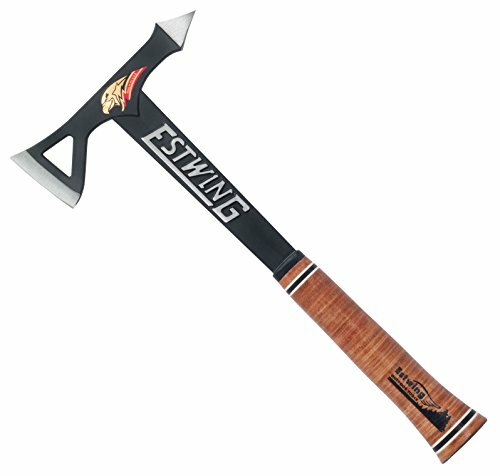 A tomahawk is considered a very capable hand to hand weapon and has seen a resurgence on the market for those who are looking for tactical advantage in everyday work, for self defense situations and in case of an emergency. The utility of the best tactical tomahawks will be very high, and the versatility can be amazing depending on the situation at hand. 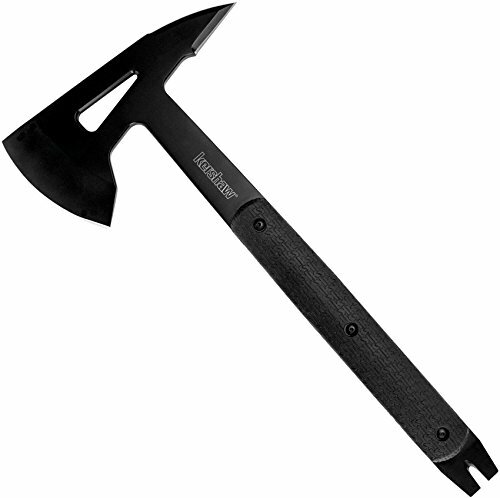 The tactical tomahawk is more than a fighting weapon, it has literally evolved to be a rescue tool; self-defense weapon and a practical construction implement, among other things. These multi-tools will be valuable when you have an applicable situation that requires their specific utility. As a weapon, they give you a last-ditch opportunity to defend yourself if you are properly trained to have the tomahawk within reach and are capable of wielding it with any real legitimacy. The tomahawk in its most modern form has roots that extend back to the Algonquian tribe; a native American conglomerate of tribes that inhabited the Eastern seaboard and mid-north states including all around the Great Lakes, and much of middle and eastern Canada. Their use of the Tomahawk was first recognized by “Westerners” in the early 1600’s and enjoyed a very important role in early plains expansion for the American settlers. 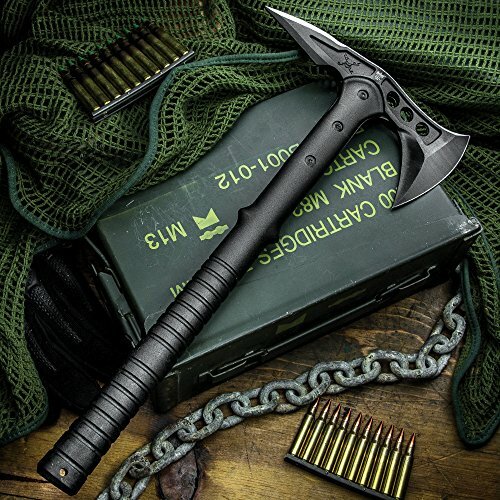 It wasn’t until the 1960’s when the Tomahawk began to have a resurgence of popularity with special forces operators in Vietnam began buying them from a maker named Peter La Gana a man of Mohawk heritage who was a World War 2 veteran. 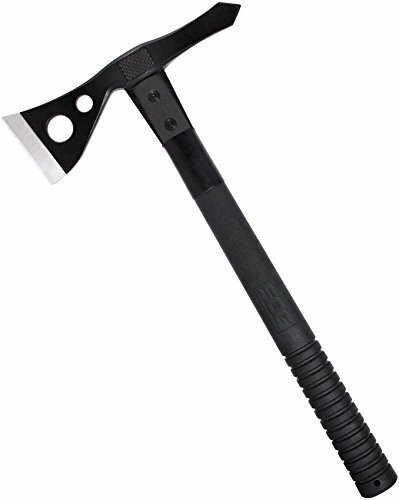 The tomahawk has seen another rebirth in the age of the prepper as tactical tools have become more popular in the last 5 years or so. What follows is a list of the best tactical tomahawks as compiled by us, weighing the benefits and the downfalls of the individual designs available for purchase on the broad market by major makers. The Kershaw 1073X Siege Tomahawk has a pretty comfortable handle made of glass reinforced nylon which offers a hand filling profile that can be very helpful during the swing and contact of a tomahawk action. 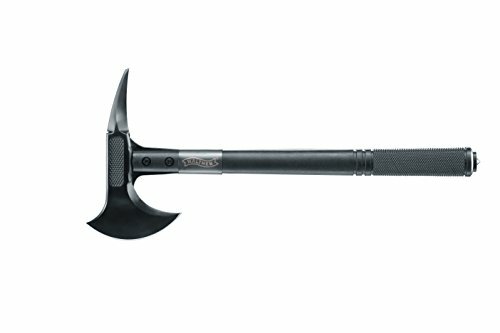 WHY IT IS RECOMMENDED: This is an inexpensive and well-balanced tomahawk with a straightforward and intuitive design. The Kershaw company is well known in the segment and in the knifemaking business and the credibility of the company for edged weapons is high. Walther has been a name in firearms for many years and this is a natural extension to grow the brand, but it is not as straightforward as some of the other fighting tomahawks on this list. It is also not as durable or useful (functionality-wise) as some of the other tomahawks and so therefore it occupies a practical but not super versatile spot on this list. WHY IT IS RECOMMENDED: A unique design and some legitimate performance dealing aspects including some distinctly offensive and distinctly defensive elements that will make this an effective tool for actual fighting. It also has a few other tools available to it and may be a good car tomahawk due to the glass breaker on the handle. 3 tools in 1: Axe, Hammer Head, Pry Bar. 420HC steel body w/ Cerakote® will not bend or break. Desert Tan G-10 composite scales on handle for grip. MOLLE-compatible sheath attaches to pack, webbing, or body armor. Get the job done on the first try. Unfortunately, while this one should easily be the most useful tool on this entire list it is one of the least useful, and yet it still makes the list. 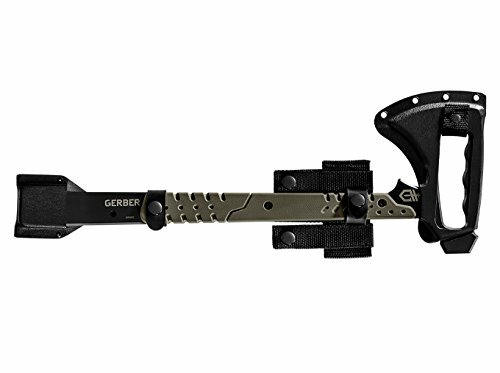 The Gerber is well built and offers a plethora of tools, but it lacks a fundamental trait of a true tomahawk: balance throughout and leverage on the head. All that said: it is still probably worth every bit of its very expensive price tag for the benefits it does offer to a multi-tool user. WHY IT IS RECOMMENDED: As mentioned above, it is not a true tomahawk because of the lack of strategic balance and leverage. But despite its shortcomings, the handle is well built, the tools are thoughtful, and the lifetime warranty alone probably makes it worth every penny, because if you have it near you, you can always use it for something. Easily the most capable (strictly) fighting tomahawk in this list and from the least likely candidate to make it that way. 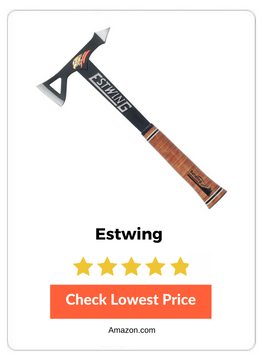 Estwing makes daily hard use tools though, and if you think about it, the tomahawk is just an edged hammer; Estwing makes some of the best hammers in the world. Now we know, they also happen to make some of the best fighting tomahawks in the world. For the money this is the best tactical tomahawk for actual real-world use. WHY IT IS RECOMMENDED: Extremely well built, lightweight and has perfect swing and balance. The Estwing is like an extension of your arms. 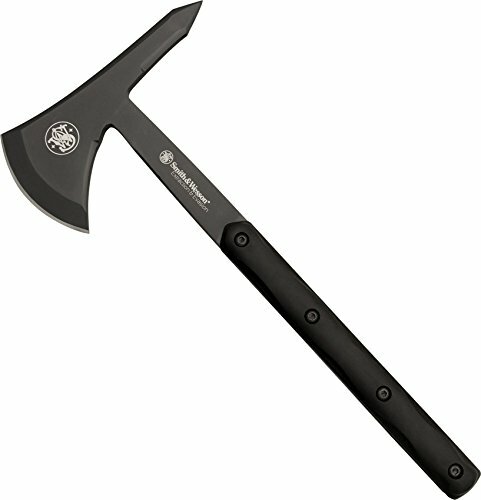 A good budget tool, or a great first tomahawk for fighting use, the SOG is a good beginner tomahawk due to the simplicity and durability, combined with the lifetime warranty. WHY IT IS RECOMMENDED: SOG has a great reputation and the lifetime warranty doesn’t hurt; despite its somewhat simple design it is still a very effective tool. The M48 tomahawk is strictly to be used for an occasional use weapon. It is capable of easily incapacitating an opponent but if it were to be used daily for legitimate tasks, the durability would constantly be in question. WHY IT IS RECOMMENDED: Yes, durability is a huge factor, and this one has none of the durability that is needed for daily use, but if you plan on having this in a defensive weapon location it is well capable of killing someone in a single blow. Everything about this tomahawk is top notch except the durability. If you want a single use backup item the M48 tomahawk is a great choice but don’t use it daily. Cold Steel is normally quite a durable option. In this case, the tomahawk suffers from a lack of a full tang. It is however a very capable defensive weapon in a close quarters battle, and as such, still retains high marks for the lethality of a single swing. WHY IT IS RECOMMENDED: The low price and the capability of a single blow incapacitation makes the Cold Steel a powerhouse of balance and leverage. 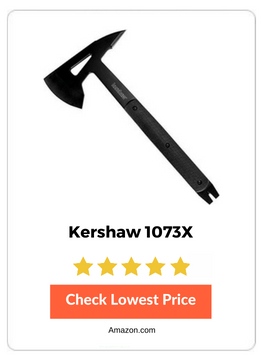 It scores low marks for durability though, so if you want a daily tool, do not pick this one. NORSE DESIGN: Axe head shape has a deep beard that echoes Viking style. UNIQUE HEAD: Deep beard design is balanced and pure burliness boosts it into a league of its own. 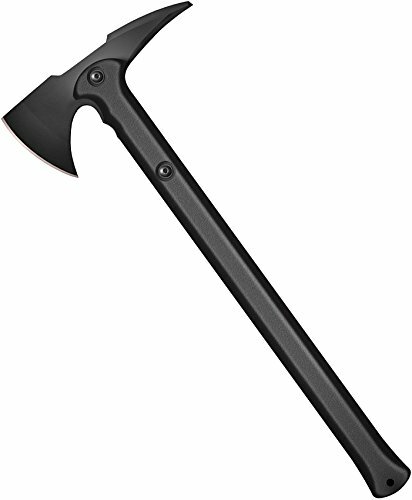 The CRKT Freyr Tactical Axe is a good looking axe type tomahawk that is perhaps better for small kindling type work than it is for fighting, but certainly capable of delivering a decisive blow to end a conflict if needed. WHY IT IS RECOMMENDED: The use as a bush craft tool is what makes the CRKT Freyr Tactical Axe a contender. It is not as durable as it could be but it’s not horrible either. The axe type head is utilitarian, and the swing is heavy on the leverage. The Smith & Wesson SW671 is a good option for the price, but you will want to have practice with it. It’s heavy and hard to swing without practice. That said, it’s very durable and offers great coverage against a knife attack. The potential for blunt force trauma is admirable. WHY IT IS RECOMMENDED: The full build is bulletproof if you don’t do something stupid with it. The heavy axe type tomahawk offers some good bush craft angles, but it may not be the tomahawk for everyone due to the heavy weight. CRKT has a great tool here, but it is a bit one note, a bit heavy and a bit unbalanced for true tomahawk leverage. That said, it’s an admirable performer with one of the best grips in the game for a tactical axe. WHY IT IS RECOMMENDED: The handles alone could make this a contender, even with the rich price point and the relatively awkward balance. This is a long-life tool if you treat it right and the CRKT has a pretty good warranty. Why would you want a Tomahawk? A Tomahawk can be a very effective tool, even more so than a knife or many other hand to hand weapons. It is multi-purpose in most cases and can act as both a specific offensive weapon and a strictly defensive weapon. The balance of the two, with the experienced operator will allow the user to have a distinct upper hand in CQC (Close Quarters Combat). It’s not a gun, and it is not a long sword, it will require you to get up close and personal with an enemy combatant should you choose to implement a tomahawk in your defensive or offensive strategy. It is an implement of close quarters combat and as such requires some knowledge and experience to wield well in a combat situation. Furthermore, a tomahawk in the tactical sense is not just a weapon first and foremost, instead it is a multi-faceted tool that has distinct abilities as a breeching tool a hammer and a rescue device among other duties depending on the specific manufacturer and product. Not all tomahawks are multi-tools and not all are straight fighting tomahawks. That is what made this list so hard to compile: The Tomahawk has many interpretations on the open market and if it wasn’t for the benefits of having choice, it might be quite annoying to narrow down the best candidates for the top tactical tomahawk. In the grand scheme of things, you want a tomahawk because of leverage. The design of a tomahawk allows for excellent swinging capabilities; the handle allows for defensive use; the sharp edge makes it easy to injure/or kill an opponent and the strength of the design makes it a legacy tool with long lasting potential. In the case of a fight, there are many weapons that are commercially available that one would rather replace with a tomahawk and that effectiveness is what keeps a tomahawk relevant. It has timeless qualities of versatility and lethality and provides easy, intuitive use for the new tomahawk owner. Close Quarters Battle (CQB) or CQC (Close Quarters Combat) which is a term we will use interchangeably in this article; is a messy proposition and it is about as primal and raw as one can get in a defensive scenario. This is not the protected position of the long-range shooter. It is not even as comfortable a place to be in as the sword wielding fighter will have. The length of the tomahawk for fighting purposes will require you to get up close and personal with your combatant. in close quarters battle you don’t want to lose the upper hand by bringing the wrong tool to the fight. A tomahawk is usually the better weapon if it comes down to that, with the abilities it has as a defensive weapon, and the multiple angels of attack as well as the superb leverage it can enjoy. A tomahawk has multiple sharpened edges generally; and yet it is still primarily prized for the amount of energy that can be achieved through swinging it. It also features a pick type head, or a hammer as is the case with most of these list items, this is a particularly brutal way to inflict injury on a combatant, but it can be quick and decisive in hand to hand conflict. The long handles can deflect or parry knife blades to the benefit of the user and the heavy head weight of the tomahawk can easily deal a killing blow to your opponent. With proper training and practice, an experienced tomahawk user will almost always have the upper hand if a fight ever gets to a hand to hand situation. But make no mistakes, hand to hand combat with edged or swung weapons is not a clean experience. So, understand ahead of time if you are willing to utilize a tomahawk so you don’t find yourself questioning the choice when you need to be decisive. The heavy-duty metal and materials that are part of the modern fighting tomahawk provide a long defensive perch with which to deflect knife strikes or to block a fist or other weapon. Every tomahawk on this list offers a handle and head in the tradition style which can easily be used to increase leverage to stop a hand to hand threat easily with practice. Not all tomahawks are fighting tomahawks, however, and many can be used for more than just swinging at the head or arms of an opponent in a life or death situation. The tactical axe design gives even more room to breathe in a close fighting situation, but more realistically, if you have a proper plan for defensive combat, you will be trying to avoid conflict/threats in a close quarters type of a scenario. Ideally you will have used a firearm to mitigate the threat well before it gets to that point. Therefore, then, even a fighting tomahawk is rarely if ever, used against another human being. So, it has evolved into a battlefield tool and a tool of multiple uses because having one around in case of a defensive need is good, but having a tool that can be used daily is even better. The best tomahawk will be the one that performs the most useful set of duties with the best possible traits for those tasks and acts as an effective last ditch offensive weapon and a strong defensive implement. It would be ridiculous to get a gun and never shoot it or practice with it. Worse than that, a gun is much easier to use in a defensive situation than a tomahawk because of the level of threat that exists at the distance common to actual usage. With a gun, even a handgun you can realistically engage as far as 50 yards away and reasonably expect to deter or disable the threat. The tomahawk requires a few feet to engage with it. By the time the conflict gets that close to you, you will be wishing you were an expert at using a tomahawk. There are many options for learning how to use a tomahawk in the most basic sense, but what you absolutely must do, even if you don’t take some form of formal lesson (whether it be in person or watching a video on YouTube or some other format), is you must know what it feels like in the hands and you must feel comfortable with it. Knowing how the heft is in your hands; and what a true swing feels like and how slippery it will get when you are sweating and full of adrenaline are all important factors. Knowing what it feels like to strike a legitimate target with it will be an important factor. Knowing how to deflect a bladed weapon by understanding hand placement and using the leverage of the length of the weapon will be an important factor. Understanding that there are many ways to utilize a tomahawk both from a cutting perspective and as a blunt force tool will give you unique insight into the capabilities of your weapon. No matter what you do, learn how to use your tomahawk at least as a tactical tool for having around when you might need the utilitarian aspects of it. But better than that, take a combative class that focuses on de-escalating a CQB conflict and wielding a fighting tomahawk, your newfound knowledge could mean the difference between life and death. When you need a last ditch defensive tool that can protect you in a knife fight, a tomahawk may be a perfect choice. 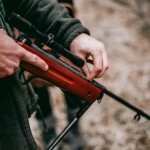 The key is to find one that has enough leverage and durability in the build quality to ensure that you can withstand direct hits and be protected under stress. As an offensive weapon, any of these tomahawks are capable of killing another human being, but close quarters combat is a nasty thing, so make sure you have the conviction to proceed with it, and the stomach to handle the outcome if you decide to go into battle in close proximity. As a tool for daily use though, these tomahawks are more than capable from chopping wood to opening doors to breaking windows in a recuse need to offering a strong cutting option. A tomahawk in the modern era is more than just a tool to fight with: it can be much more. The best tactical tomahawks are something more than just a single job performer, and this list is full of versatile tools. There are many tactical tomahawks to choose from. Be sure to figure out what it is you want to use it for then read through our detailed reviews!